For centuries, scholars have searched in vain for any remnant of Solomon’s Temple. The fabled Jerusalem sanctuary, described in such exacting detail in 1 Kings 6, was no doubt one the most stunning achievements of King Solomon in the Bible, yet nothing of the building itself has been found because excavation on Jerusalem’s Temple Mount, site of the Temple of King Solomon, is impossible. 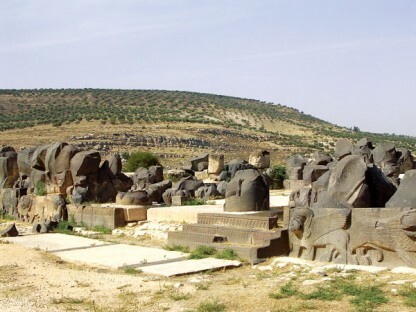 As reported by archaeologist John Monson in the pages of BAR, the closest known parallel to the Temple of King Solomon is the recently discovered ’Ain Dara temple in northern Syria. Nearly every aspect of the ’Ain Dara temple—its age, its size, its plan, its decoration—parallels the vivid description of the Temple of King Solomon in the Bible. In fact, Monson identified more than 30 architectural and decorative elements shared by the ’Ain Dara structure and the Jerusalem Temple described by the Biblical writers. The similarities between the ’Ain Dara temple and the temple described in the Bible are indeed striking. Both buildings were erected on huge artificial platforms built on the highest point in their respective cities. 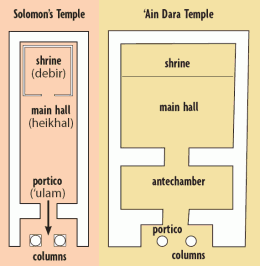 The buildings likewise have similar tripartite plans: an entry porch supported by two columns, a main sanctuary hall (the hall of the ’Ain Dara temple is divided between an antechamber and a main chamber) and then, behind a partition, an elevated shrine, or Holy of Holies. They were also both flanked on three of their sides by a series of multistoried rooms and chambers that served various functions. Certain features of the ’Ain Dara temple also provide dramatic insight into ancient Near Eastern conceptions of gods and the temples in which they were thought to reside. Carved side-by-side in the threshold of the ’Ain Dara temple are two gigantic footprints. As one enters the antechamber of the sanctuary, there is another carving of a right foot, followed 30 feet away (at the threshold between the antechamber and the main chamber) by a carving of a left foot. 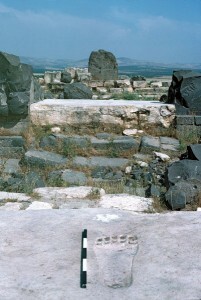 The footprints, each of which measures 3 feet in length, were intended to show the presence (and enormity) of the resident deity as he or she entered the temple and approached his or her throne in the Holy of Holies. Indeed, the 30-foot stride between the oversize footprints indicates a god who would have stood 65 feet tall! In Solomon’s Temple, the presence of a massive throne formed by the wings of two giant cherubim with 17-foot wingspans (1 Kings 6:23–26) may indicate that some Israelites envisaged their God, Yahweh, in a similar manner.